Former President Bill Clinton is in town, campaigning for President Obama. At 5:30 pm, he held a campaign rally in Adams County, near Denver. At 7:30 pm, he will be at Denver's Manual High School. On Thursday, President Obama will campaign in Boulder. Sounds like a "Get Out the Vote" effort, since Denver, Boulder and Adams County are largely Democratic. In Mitt Romney news, I just muted the TV. The same ad has come on twice in 15 minutes: an elderly woman talking about how Mitt gave the eulogy at her 14 year old son's funeral -- more than 30 years ago. That qualifies him to be President? It's sickening to see those making his campaign ads (in this case Crossroads) use this elderly woman and exploit her son's death. Is there anything Mitt Romney won't try and capitalize on? Mitt Romney: Capitalize and Privatize. 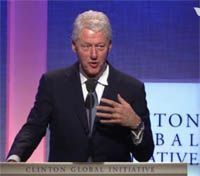 Former President Bill Clinton is about to speak at the Clinton Global Initiative. You can watch live here. Or follow on Twitter here. UPDATE by BTD - I'll be attending the CGI this afternoon at some point and maybe tomorrow. Anything in particular anyone want covered? He also said both he and Hillary are too old to be put on the Supreme Court now -- not because they can't do it but because it would be better to pick someone with more energy in their 40's or 50's....meaning someone who will serve longer. “My advice to him would be to first of all see what the court is missing…The important thing is that you think they're smart and they're competent and they understand the lives of ordinary people. Now one thing I think he should think about is have we…gone too far in this process that assuming only judges can be elected? That somehow you're not qualified if you weren't a judge." Today President Bill Clinton was admitted to the Columbia Campus of New York Presbyterian Hospital after feeling discomfort in his chest. Following a visit to his cardiologist, he underwent a procedure to place two stents in one of his coronary arteries. President Clinton is in good spirits, and will continue to focus on the work of his Foundation and Haiti's relief and long-term recovery efforts. In 2004, President Clinton underwent a successful quadruple bypass operation to free four blocked arteries. Send good thoughts his way. Update: ABC News reports Hillary Clinton is en route to New York. Follow the Clinton Foundations' twitter feed for updates. He's already a trending topic. CNN reports Chelsea is at the hospital too. The Sunday New York Times Magazine has a long article on how Bill Clinton is mellowing. And aging. Clinton at 62 looks older than the boy president who dominated American politics in the 1990s, but he remains more robust than most men his age and full of intellectual energy. His left hand trembled a little bit during dinner, as it tends to do late in the day. It worried him enough at one point that he had himself tested for Parkinson’s disease, but the results came back negative; his doctor says he has just signed too many autographs over the years. When I mentioned that he had to get hearing aids during his White House tenure because of the effects of too many campaign rallies, he cheerfully pulled out the latest equipment from his ear and showed off how sleek and virtually invisible it was. Nearly half of Democrats (48 percent) think Hillary Clinton has a better chance of beating John McCain in November — 10 percentage points higher than the 38 percent who think Barack Obama can win, according to a FOX News poll released Wednesday. This represents a significant shift from March, when Democrats said Obama was the candidate more likely to beat McCain. Democrats continue to favor Clinton as their party’s leader, albeit narrowly: 44 percent want her to win the nomination and 41 percent want Obama. Last month Clinton was preferred by 2 percentage points. There's also an NBC/WSJ poll out taken of all voters, not just Dems. It finds Bush is a liability to McCain and Obama's "bitter" remarks cost him in favorability, as did Rev. Wright. New Mexico Governor Bill Richardson will appear with Barack Obama in Oregon Friday and provide his endorsement to him. "I believe he is the kind of once-in-a-lifetime leader that can bring our nation together and restore America's moral leadership in the world," Richardson said in a statement obtained by the AP. "As a presidential candidate, I know full well Sen. Obama's unique moral ability to inspire the American people to confront our urgent challenges at home and abroad in a spirit of bipartisanship and reconciliation." Friday night, every cable news show I watched, mostly on MSNBC, took former President Bill Clinton to task for reverting to attacks on Barack Obama, much like he did before the South Carolina primary. Now comes the Dallas Morning News, with just the opposite story. Headline: "Bill Clinton avoids attacks on Obama in East Texas." On a campaign swing through East Texas on Friday, Bill Clinton said over and over that he has nothing against Barack Obama. "I'm not against anybody," he told an overflow crowd in the student center at Tyler Junior College. "I'm for Hillary." Later, he added: "If you disagree, you have another very attractive choice." The former president, admitting that Texas looms as a make-or-break state for Hillary Rodham Clinton's presidential hopes, scrupulously avoided attacks on Mr. Obama – attacks of the type for which he was roundly criticized after the Jan. 26 South Carolina primary.